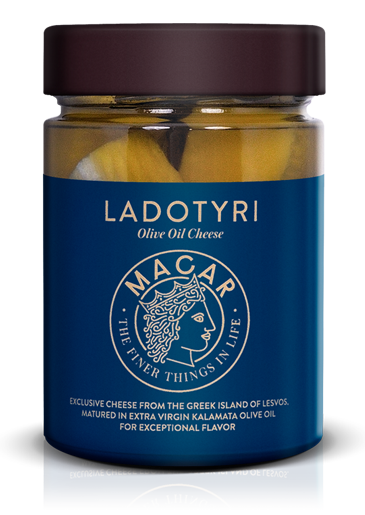 Ladotyri matured in Extra Virgin Kalamata Olive Oil, both exclusive products of protected Greek origin (P.D.O), especially joined together by MACAR for gourmet lovers with eclectic taste. 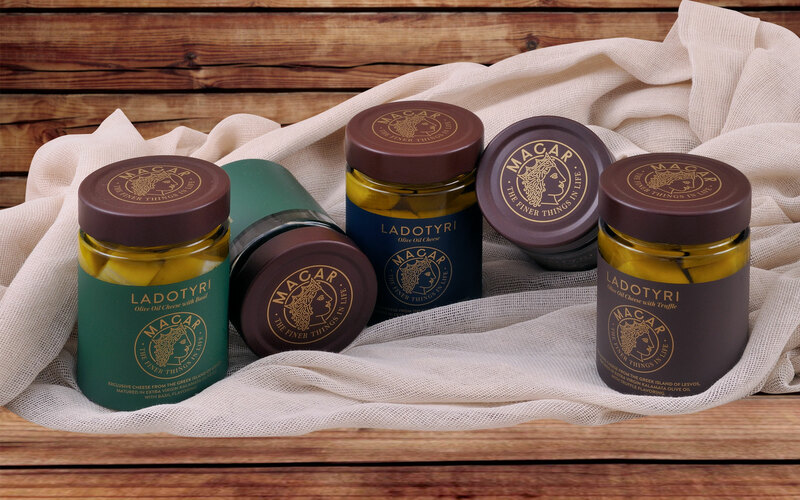 The longer Ladotyri remains immersed in olive oil, the more unique it becomes. The passing of time is marked by a very distinct sharpness and an intense aroma, while the olive oil adopts a robust, peppery taste that makes for the perfect dressing or finishing oil. With only a limited number of quantities produced each year due to the importance placed on the island’s premium milk seasonality, MACAR guarantees the premium quality and exclusivity of its products. Each glass jar we lovingly prepare is handled with great care and marked by an exclusive annual production number. 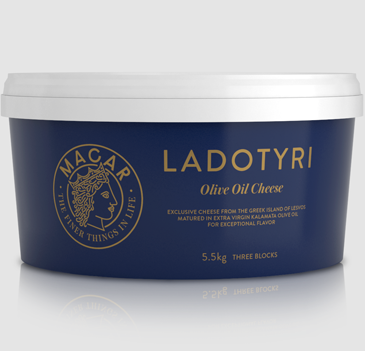 The classic label of MACAR Ladotyri is the signature flavor, by which the cheese and maturing practice is recognized. It is by far the vanguard of all other flavors to follow, as it captures the true essence of each ingredient. The sharp, spicy flavor of the cheese is accentuated by the bold flavor of the Extra Virgin Kalamata Olive Oil of the highly praised Koroneiki variety. The pairing of basil and ladotyri is a match truly made in heaven. 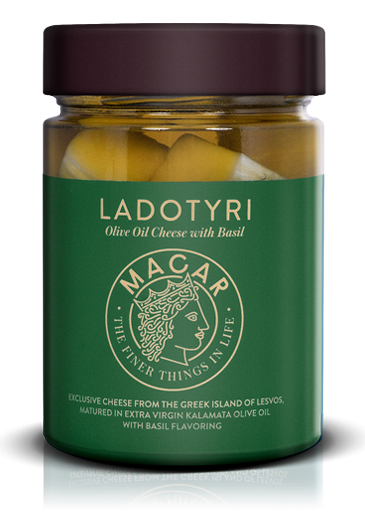 Basil lovers who crave its sweet, yet savory taste are sure to fall in love with the MACAR Basil label. The sharpness of the cheese is blanketed ever so gently by the green, slightly minty aroma, leaving a mouth-watering sensation for more. 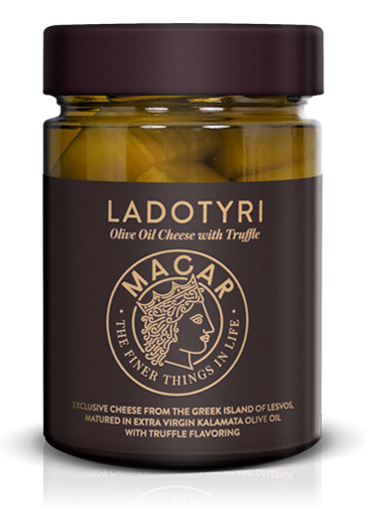 The MACAR Truffle label offers a very modern twist to traditional Ladotyri Mytilinis. The earthy aroma of truffle merges with the grassy notes of the olive oil to create a truly divine flavor – initially soft on the palette before leaving a pungent aftertaste that pleasantly stays with you.